ASEAN watchers may have heard of the adage, “when two elephants fight, it’s the grass that gets trampled; and when they make love, the grass suffers as well.” The first part of the adage is said to be an old Swahili proverb, whereas the latter half is an adept appendix by Lee Kuan Yew. The former shows the grievances of the weak vis-à-vis the bullying forces, whereas the latter represents the complex feelings of vigilance and apprehension of weak powers toward the egoistic behavior of the mightier powers. In the Asia-Pacific region, this adage may be applicable to the South China Sea disputes, where the US-China (two elephants) rivalry leaves the ASEAN countries and, to a lesser extent, Japan (the grass) deeply concerned and vigilant about the development of bipolar relations: fighting or love-making. This piece tries to shed light on the South China Sea disputes with special emphasis on three factors: a rising China, the US-China rivalry, and the concept of “ASEAN centrality.” These three components emerged in the early 1990s and gradually grew more significant in the twenty-first century, influencing each other. In order to analyze the contemporary dynamics of this triangular relationship in the Southeast Asian context, I consider the recent encounter among the three at the Fourteenth Shangri-La Dialogue in Singapore from May 29-31, 2015, where the most conspicuous issue was the South China Sea disputes. In his opening remarks, John Chipman, director-general of the host IISS, candidly pointed out that “(t)he defining characteristic of the region has become ‘strategic unease,’” due primarily to resurgent tensions in the South China Sea. Both in plenary and Q&A sessions, most speakers, especially US and Chinese delegates, touched on the South China Sea issue, although it was not on the agenda. At the dialogue, where some 500 government and military officials as well as “Track II” delegates from 38 countries attended, the South China Sea disputes drew major attention. Although Secretary of Defense Ashton Carter and PLAN Deputy Chief of Staff Admiral Sun Jianguo spoke candidly about the South China Sea situation, their tone was less provocative than during the Thirteenth Dialogue the previous year. How did the ASEAN delegates respond to the Sino-US debates at Shangri-La? Among their presentations, the keynote address by Prime Minister Lee Hsien Loong was exceptional as a presentation by the host at an opening session—substantial, enlightening and rich in contents. As to the South China Sea disputes, Lee warned of the danger of a vicious cycle because “(e)ach country feels compelled to react to what others have done in order to protect its own interest.” According to him avoiding a physical clash is not enough, because a compromise “on the basis of might is right…will set a very bad precedent.” The best scenario for both China and ASEAN is to conclude a binding Code of Conduct, he concluded. In speeches by other delegates of ASEAN countries, two opposite trends appeared. On the one hand, no voice from the hardline disputants in the South China Sea disputes—the Philippines and Vietnam—was heard. Indeed, no name of the Vietnam delegate appeared in the agenda. As for the Philippines, Vice Admiral Alexander Lopez made a very low-key presentation, without mentioning the disputes in the Western Philippine Sea (i.e., South China Sea) per se. On the other hand, Dato’ Seri Hishammuddin Tun Hussein, Malaysia’s Minister of Defense, made a remarkable speech, stressing the importance of “a strong ASEAN’s…stabilizing influence in the region,” and aptly mentioning the South China Sea issue as “the elephant in the room .” He warned “(i)f we are not careful, it could certainly escalate into one of the deadliest conflicts of our time, if not our history.” But he deliberately pointed his finger at neither China nor the United States in regards to the tensions aroused by China’s island reclamation in seven areas since early 2014. The overall impact of ASEAN’s inputs was rather favorable to China in that they were not provocative when they touched upon the South China Sea issues. Whether this was just a coincidence or the result of deliberation among the ASEAN member countries deserves further analysis. The South China Sea disputes can be described in at least two ways. First, they are a “Pandora’s Box,” in the sense that a train of tensions and conflicts emerged one after another, putting these disputes at the core of the vicious spiral facing the region’s countries. Some littoral countries (Vietnam and the Philippines among others) censured China’s unilateral reclamation around the Spratly Islands as illegal as well as dangerous. The United States supports those countries, claiming that China has endangered freedom of navigation and overflight, and refuses to acknowledge the legitimacy of China’s claims. China, on its part, categorically dismisses those criticisms, claiming the reclamation is within its sovereignty and justified. Some countries are already worrying about the possible scenario of an Air Defense Identification Zone (ADIZ) in the South China Sea by Beijing. Not a few Japanese have a sense of déjà-vu, because only two years ago, in November 2013, China unilaterally declared an ADIZ in the East China Sea including the Senkaku Islands, and adamantly demanded that any fights that enter the ADIZ report their identity to Chinese authorities at the risk of facing “defensive emergency measures” by the Chinese air force. Tokyo warned world opinion and Asia-Pacific countries of a “China threat.” Taking this incident seriously, Washington dispatched two B-52s to the area without prior notification, “in direct challenge” to China’s ADIZ. Second, the South China Sea disputes are a “Black Hole,” absorbing almost all conciliatory ideas in the Asia-Pacific region, voiding proposals and scenarios for peace and stability. When China, for instance, asserts that she respect international law and norms, its unilateral activities in and around the Spratly waters made a mockery of the 2002 Declaration of Conduct (DoC) between China and the ASEAN nations, explicitly inhibiting such unilateral activities which aggravate tensions in the region. The South China Sea disputes are symbols of strategic distrust. Insofar as they remain unsettled, a “cooperation spiral” is out of the question. The US-China relationship have been far from stable, twisting and turning at so many points—for ideological as well as strategic reasons—that it is aptly dubbed a “roller coaster ride.” In 2012, Graham Allison’s essay on the “Thucydides trap” appeared in the Financial Times.3 After quoting Greek historian Thucydides’ findings that “what made war inevitable was the growth of Athenian power and the fear which this caused in Sparta,” Allison observed that “(i)n 11 of 15 cases since 1500 where a rising power emerged to challenge a ruling power, war occurred.” He is warning that the mounting US-China rivalry could, if not managed properly, lead the two great powers to aggravated distrust, hostility, and eventually war. How, then, have Washington and Beijing dealt with ASEAN? There are three dimensions: 1) a contested area that each power attempts to pull into its orbit; 2) an unwelcome solicitor of their involvement in intractable disputes; and 3) a buffer zone that may have soothing effects. First, President Obama in a speech in Jamaica prior to the Caribbean summit, worried that Beijing is “using its sheer size and muscle to force countries into subordinate positions,” to which China immediately retorted that everyone can see who is using the biggest size and muscle in the world. Second, as far as territorial sovereignty is concerned, Washington has made it clear, time and again, that it will remain neutral lest it should “fish for trouble” in the South China Sea. Third, the United States and China agreed in 1993 on the establishment of the ASEAN Regional Forum (ARF)—a multilateral scheme, emulating the CSCE experience of cooperative security in Europe, under the leadership of ASEAN. In 1995, at the second ARF meeting at Bandar Seri Begawan, Brunei, ASEAN produced “ASEAN Regional Forum: a Concept Paper,” which explicitly declared ASEAN’s role as “the primary driving force” in the multilateral security dialogue. It urged the ARF members to emulate ASEAN’s record of enhancing peace and development in general (explicitly) and the “ASEAN Way” (implicitly) in particular. In addition, it introduced a three-staged scenario—promotion of confidence building, development of preventive diplomacy mechanisms, and development of conflict resolution mechanisms4—as a gradual, evolutionary approach to security in the Asia-Pacific region. “ASEAN centrality” became an acceptable notion to both the US and China. Third, those who would counter Chinese power are most likely to appeal to China’s adversaries, both real and potential. Thus, the easiest, and perhaps most effective way is to improve relations with the ASEAN countries. Yan Xuetong, who is said to be close to the Xi Jinping leadership, argued that “China’s rise will be more effectively achieved by fostering friendly relations with neighboring countries, rather than focusing on improving US-China relations.”7 Whereas this message sounds accommodating, it is daunting to know the underlying reasoning of Yan’s proposition is not genuine friendship but a blatantly realist calculation to the effect that “(f)aced with the reality that China is stronger than they are, neighboring countries must choose whether they support or obstruct China’s rise.” This is not what ASEAN countries would like to do. Now that Beijing has acknowledged the possible declaration of an ADIZ over the South China Sea, the crises of the East and South China seas are undeniably interlocked. Thus, Tokyo is, like it or not, forced to be involved in the simmering situation over the South China Sea, where it has no territorial claim. But, as the weakest side of the US-China-Japan triangle—an appendage to the US-China duplex—, it has to play a delicate role. Whereas Tokyo could not yield on its sovereignty, it should behave as prudently as possible, lest it should provoke its northern giant. “Japan Is Back,” For What? These differences reflect both the changing regional security environment and Japan’s shifting perception of ASEAN. At the turn of the century, Japan could not help but admit a rising China was overtaking its superior position in the ASEAN region. Japan was still lingering in “two lost decades” in the wake of the collapse of the bubble economy in the late 1980s, whereas China had enjoyed continuous economic development at a double-digit rate. In the early 2000s, Beijing’s ascendancy over Tokyo was two-fold. In the economic arena, Beijing succeeded in winning agreement on a China-ASEAN Free Trade Area (CAFTA) in 2002. In the strategic arena, Beijing and ASEAN agreed on the long-awaited DoC of Parties in the South China Sea in 2002; on China’s accession to the Southeast Asian Treaty of Amity and Cooperation (TAC) in 2003; and on establishment of a “strategic partnership for peace and prosperity” in 2003. Tokyo had dragged its feet so long on these issues, taking into account repercussions to its domestic economy and possible negative influence on the Japan-US alliance, leaving the Japan-ASEAN relationship behind. The Foreign Ministry was reportedly unenthusiastic about accession to the TAC, which was seen as an obsolete Cold War-type device, spoiling a strategic free hand for both Japan and particularly the United States. Abe’s 2013 speech was designated the “Abe Doctrine,” apparently emulating the “Fukuda Doctrine” pronounced by Fukuda Takeo in 1977, which had emphasized three points: 1) the “heart to heart” friendship between Japan and the ASEAN countries; 2) Japan would never again become a military great power; and 3) bridging the Cold War-type cleavages between ASEAN and Indochina. The Fukuda Doctrine successfully put an end to the “anti-Japan sentiment” prevailing among the Southeast Asian peoples, that culminated in an “anti-Japan riot” in Jakarta in January 1974, which was the darkest moment for the Japan-Southeast Asia relationship since the end of WWII. The Fukuda Doctrine, in a sense, provided the ASEAN countries with a symbol of transition to graduate from the “anti-Japan mindset” molded by their agonized experiences during the Japanese occupation. Having overcome the anti-Japan sentiment, the ASEAN countries have enjoyed amicable relations with Japan. Unique features of the Japan-ASEAN relationship emerged in what became the “cauldron” of Asia. First, the ASEAN countries found “Japan, Inc.” as a model of economic development. Such slogans as “Learn from Japan” by Singapore’s Lee Kuan Yew and “Look East policy” by Malaysia’s Mohammad Mahathir—both ASEAN leaders painstakingly tried to emulate the Japanese way of economic development—were but the most prominent cases. Japan’s model was followed first by the “four small dragons”—Taiwan, Hong Kong, Korea, and Singapore—, then by the ASEAN countries (including Vietnam by the time it joined), and China in a “flying geese” configuration. Yet, by the turn of the century, Japan was viewed as lacking dynamism economically, while the rise of China was offering abundant economic benefits to ASEAN states. To the extent that ASEAN centrality was about increasing trade, China was seen as a more important actor than Japan. China took the initiative, and Japan often was playing catch up. Second, in terms of peace and security, Japan and the ASEAN countries closely cooperated for, and succeeded in, the peaceful settlement of the Cambodian conflict from 1978 to 1991. Beijing, for its part, also improved its relations with ASEAN countries under the pragmatic leadership of Deng Xiaoping. The image of a threatening China faded in the process of joint struggle against the Vietnamese attempt to install a puppet regime in Cambodia. Focused on economics and unaccustomed to viewing Japan as a factor in security, ASEAN did not at first look to Japan when security problems emerged, notably after 2000. The return of Abe to power with a record high approval rate in December 2012 marked a turning point after two decades of economic as well as diplomatic doldrums. Abe’s thrust has been two-fold: “Abenomics” and “Japan is back.” The former is economic rejuvenation through development and financial stimulus. The latter includes the resurgence of conservative, realist initiatives in the political and diplomatic arena. Abe candidly portrayed his initiative as “Japan is back,”9 when he spoke at CSIS, Washington, D.C., in February 2013. Domestically, he wants to liquidate the past, self-guilt mindset embedded in the Japanese polity in general and accomplish a long-due revision of the peace constitution. On the diplomatic front, his major thrust is two-pronged: strengthening the US-Japan alliance and hedging against a rising and assertive China, with the diplomatic row over the Senkaku Islands in mind. While Japan’s strategic engagement in the region is legitimate, its position is delicate. In contrast to Washington, which, as a great power, can afford to choose accommodation or confrontation with Beijing, Tokyo has to be neither belligerent in its impression nor provocative in its expression. In order to restrain China without provoking it, the Japanese need patience, tenacity as well as shrewdness lest they became a victim of pessimism, cynicism, or skepticism in dealing with an intransigent China. The cooperative partnership with ASEAN may be of much help for such an endeavor. What Tokyo can be proud of is not the past empire established by military force, but the postwar success in building a peace-loving nation and a peaceful country by learning the lessons of history. Japan’s SDF has never violated the border of another nation, tried unilaterally to change the regional status quo, or killed anybody for more than seven decades. ASEAN countries may well acknowledge that few, if any, countries have such a remarkable record in the contemporary world. Both Washington and Beijing, to varying degrees, agree that ASEAN could play an important role in the maintenance of peace and security in the Asia-Pacific region in general and in the South China Sea dispute in particular. What is not clear, however, is what role, exactly, is expected of ASEAN. Some may consider that a group of such weak and small countries could not make any tangible contribution to regional peace and security, let alone the international order. In fact, ASEAN has contributed to regional peace and security in at least three ways: 1) providing region-wide strategic dialogues including the great powers (sitting in the “driver’s seat”); 2) producing scenarios and ideas for regional peace-building (non-threatening initiatives); and 3) eliminating negative provocations within the region (ASEAN-ization of Southeast Asia). These contributions can be called “Pax Aseana.” At the outset, major powers let ASEAN take a leading role for peace and security through multilateral dialogue, such as in ARF. As a prominent realist, ASEAN watcher Michael Leifer, once put it, “bricks made without straw are better than no bricks at all.”11 There are substantial merits of ARF in fostering confidence through habits of dialogue among the major powers in the Asia-Pacific region. “Unity in diversity” is one of the sacred cliches in the ASEAN lexicon, reflecting the heterogeneity among its members in terms of ethnicity, religion, languages, level of economic development, political systems, and strategic orientations. In order to secure unity and cooperation among such heterogeneous member countries, they have nurtured what has become a unique modus operandi, i.e., the “ASEAN Way.” In the words of Adjit Singh, former secretary general of ASEAN, the “ASEAN Way” is “that undefinable expression that readily comes to mind when we want to explain how and why we do the [sic] things the way we do.”12 At the risk of oversimplification, it can be explained as an amalgamation of three sets of norms: 1) universal norms like respect for sovereignty and non-interference in internal affairs; 2) procedural norms such as decision-making by consensus and agreement through deliberation; and 3) deference to “Asian values,” including, among others, preference for orderly society over individual freedom, respect for authority, and appreciation for face. During the 1980s, ASEAN was dubbed a “one-issue organization,” because it had been preoccupied with the Cambodian conflict, caused by Vietnam’s invasion and occupation of Cambodia, both of which are now members of ASEAN, for more than ten years. The Cambodian conflict was a three-faceted issue for ASEAN, and so are the South China Sea disputes. First and foremost, it is a threat to the peace and security of the ASEAN region as a whole and claimant countries in particular. As the “nine-dashed line”—which covers almost 90 percent of the South China Sea—implies, China may someday take all the islands, reefs, shoals, and atolls within the nine-dashed line by means of military force; no ASEAN country is free from the threat. Second, it is a theater where ASEAN can appeal to world opinion, mobilizing international support on its side against China. Finally, it is a trial of the unity of the ASEAN member countries facing a critical situation. For more than a decade of the Cambodian conflict, ASEAN suffered serious discord among member countries, although they were unanimous about their basic position of peaceful resolution of the conflict: guaranteeing security to Thailand, a “frontline state,” insisting on the immediate and total withdrawal of Vietnamese troops from Cambodia, supporting the self-determination of the Cambodian people, and denying a puppet government installed by Hanoi as a fait-accompli. Whereas Thailand and Singapore stood tough against the Vietnamese occupation of Cambodia, Indonesia and Malaysia were soft toward Hanoi. ASEAN was shaken by this discord to the extent of nearly dismantling the regional body more than once. In a similar vein, ASEAN has been haunted by the South China Sea disputes, especially since 2010 when China’s foreign policy turned more assertive. Although ASEAN is unanimous in support of peaceful resolution of the disputes, there is a four-fold discord: non-claimants (Cambodia, Laos, Myanmar, Singapore, and Thailand); tough disputants (the Philippines and Vietnam); moderate claimants (Brunei and Malaysia); and an ambiguous Indonesia. While all want peace and stability in the South China Sea, their attitudes differ substantially on how to attain this. At their forty-fifth ministerial meeting (AMM) in 2012 in Phnom Penh, they failed to issue a joint statement by consensus for the first time in ASEAN’s 45-year history due to disagreement between the chair Cambodia, a China protégé, and the Philippines and Vietnam. Both sides stick to their position to the detriment of ASEAN consensus and solidarity, causing a serious blow to ASEAN’s international reputation, which had been painstakingly nurtured for four and a half decades. In mid-June 2015, Beijing announced the near completion of land reclamation projects in the South China Sea and its next plan to install structures for civil as well as military purposes, turning a deaf ear to US entreaties not to militarize the man-made islands and to ASEAN’s deep alarm. Daniel Russel, assistant secretary of state for East Asia, told the Washington Post that “reclamation isn’t necessarily a violation of international law, but it’s certainly violating the harmony…of Southeast Asia, and it’s certainly violating China’s claim to be a good neighbor and a benign and non-threatening power.”14 This is advice that Beijing should take most seriously. The “Thucydides Trap” remains, even if it is not a major driving force in the US-China relationship at the moment. At this juncture, ASEAN centrality could play a soothing role commensurate as an honest broker in the face of a realist world of power politics on the one hand and a constructivist project of cooperative security on the other. Whereas the constructivists appreciate ASEAN as a “nascent security community,” the realists tend to dismiss the ASEAN-driven security architecture as a regional delusion. The South China Sea disputes provide both theoretical schools with testing grounds to prove their case. Generally speaking, ASEAN leaders are realists, especially in terms of sovereignty and national interests. They all acknowledge the significance of power in international relations, but they will not simply follow the realist logic of power politics, leaving their destiny at the mercy of Washington or Beijing. Instead, they seek to confirm constructivist multilateral security dialogue as much as possible. Yet, ASEAN is allowed regional leadership as long as the major powers suffer a “trust deficit.” It needs deference to its leadership from the major powers. ASEAN centrality relies on default leadership and non-threatening initiatives. These may now be in question. Insofar as ASEAN could maintain its unity and cohesion, it could be allowed to take lead the regional architectures; but if ASEAN fails, it will become an area for great power contestation for supremacy. It must continuously pursue a narrow path with two cliffs on both sides: the risk of complacency on the one hand and haughtiness on the other. At the ASEAN summit of April 2015, ASEAN “deeply deplored” the negative developments in the South China Sea, to which Beijing responded angrily, saying China was “gravely concerned with the ASEAN statement over the issue.” Meanwhile, Beijing agreed, for the first time, to take a “dual track approach,” by which it officially acknowledges ASEAN as a partner in discussing the peace and stability in the region as a whole, while it reiterates that the South China Sea disputes per se should be discussed only among the parties directly involved. ASEAN unity and cohesion are prerequisites to its centrality, with the time limit for the establishment of the ASEAN Community being December 31, 2015. “Without unity, no centrality” was what Rizal Sukma curtly put it in his column in the Jakarta Post (July 17, 2012) in the wake of the fiasco of the forty-fifth AMM. Sukma warned that ASEAN would be marginalized in a polarizing region, “where Southeast Asia once again becomes an appendix to great power politics.” This warning was followed by a stunning message that “if other ASEAN countries do not share Indonesia’s passion for and commitment to ASEAN, then it is indeed time for us to start another round of debates on the merits of a post-ASEAN foreign policy” (italic added). Since Indonesia is commonly accepted as “primus inter pares” of ASEAN, Jakarta’s alienation deserves much more attention by ASEAN member countries as well as Asia Pacific countries including the United States, China, and Japan. 1. All documents are available at Shangri-La Dialogue 2015, International Institute for Strategic Studies, .http://www.iiss.org/en/events/shangri%20la%20dialogue/archive/shangri-la-dialogue-2015-862b. .http://www.washingtonpost.com/wp-dyn/content/article/2010/07/29/AR2010072906416.html (accessed June 25, 2015). 7. Niel Thomas, “Is China’s Periphery Becoming the Core of Its International Relations?” The Diplomat, January 29, 2015 http://thediplomat.com/2015/01/is-chinas-periphery-becoming-the-core-of-its-international-relations/ (accessed June 25, 2015). 8. Due to a hostage-taking crisis in Algiers, Abe had to cut short his tour, cancelling the speech. 9. Abe said “I am back, and so shall Japan be” and vowed to bolster, together with the United States, regional security and the rule of law in a roiled Asia with territorial disputes. 10. This was used in 1990 regarding the Japanese SDF’s dispatch of minesweepers to the Straits of Hormuz in the wake of the Gulf War. 11. Michael Leifer, The ASEAN Regional Forum, Adelphi Paper 302, (1996):, p. 59. 12. Jürgen Haake, ASEAN’s Security and Diplomatic Culture: Origins, Development, and Prospects (London: Routledge 2003), p. 6. 13. See Seng Tan, “The ASEAN Centrality,” CSCAP Regional Security Outlook 2013, . http://www.cscap.org/uploads/docs/CRSO/CRSO2013.pdf,., (accessed June 30, 2015). 14. 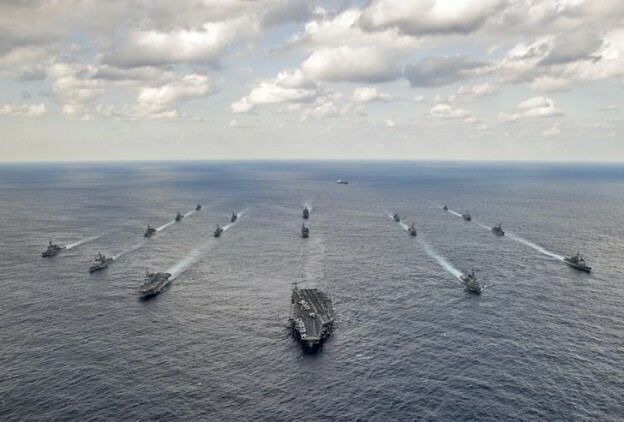 Simon Denyer, “Tensions rise between Washington and Beijing over man-made islands,” The Washington Post, May 13, 2015, https://www.washingtonpost.com/world/asia_pacific/tensions-rise-between-washington-and-beijing-over-man-made-islands/2015/05/13/e88b5de6-f8bd-11e4-a47c-e56f4db884ed_story.html (accessed July 1, 2015).